Prison Architect finally finished serving its three-year Early Access sentence. The horn blows. “Coming out,” drones a voice over the PA. The massive gate retracts, letting those inside the Early Access prison see just a bare sliver of the outside world—a world where finished games roam free, frolicking through the verdant pastures of Steam. A lone prisoner turns to the others. “It’s my day,” says the prisoner. “I’m getting out.” Some cheer. Some don’t move at all. Others drool on themselves. “It’s been a real honor serving with you other Early Access games,” says the prisoner. And then he walks through the gate, out of the prison where he’s spent three years—finally, a member of society. 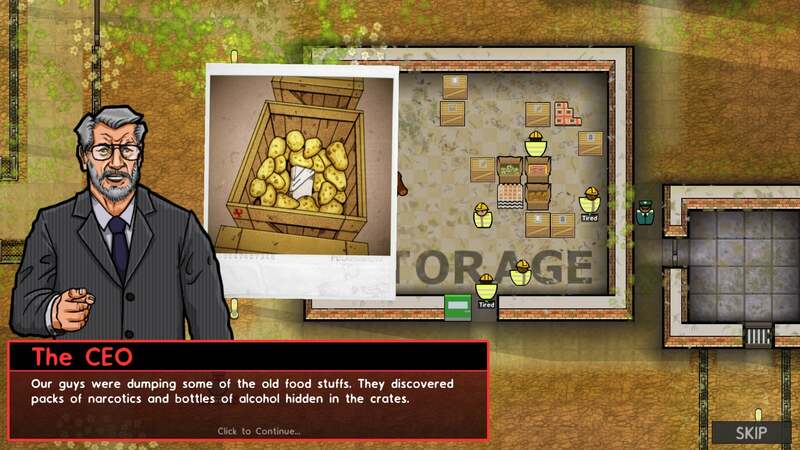 Yes, Prison Architect—one of the earliest of Early Access games—”officially” releases today after a three-year incubation, which I guess means it’s time for a review. Surreal. Prison Architect is a builder game a la Theme Hospital or Space Colony except, you know, with prisons. Your job as CEO is to take in a steady stream of criminals and feed them, house them, and (hopefully) rehabilitate them for release into society. I hope you’ve read up on your Foucault, because there’s a ton of work to do. Building the prison will, of course, take up most of your time—laying foundations for cells, common rooms, kitchens, showers, and filling them up with everything from beds to billiards tables. But there’s more to a prison than concrete walls and cots. You’ll also need to hire guards and lay out patrol patterns, coordinate work programs, watch for escape attempts, set prisoner schedules, set up programs to treat alcoholism, assign jobs to prisoners, occasionally quell riots or put out (literal) fires, coordinate release schedules, start a work program, and I could keep going. Prison Architect is overwhelming. Like some other early Early Access games (looking at you, Kerbal Space Program), Prison Architect seems to have started with an already-pretty-comprehensive list of features and then added and added and added until at final release there’s an insane amount of stuff to do for anyone approaching the game fresh. 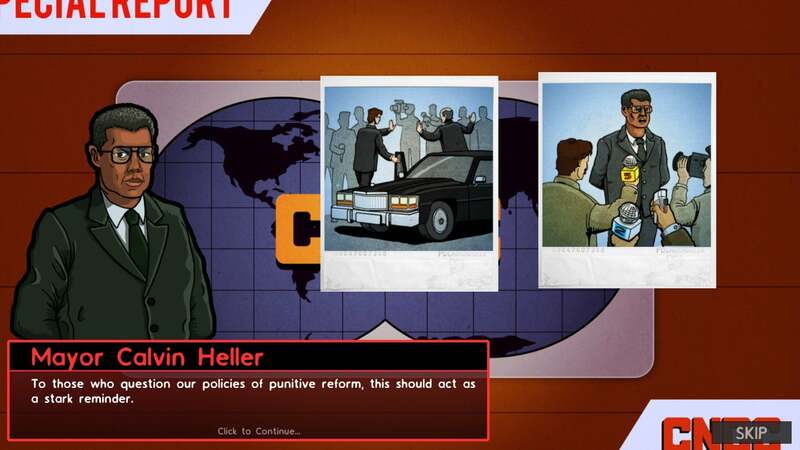 The campaign, newly expanded for the complete release, helps alleviate some of these issues by acting as part-story, part-tutorial. It’s a five-chapter compilation of stuff you’d see in Sandbox mode, but given a narrative framework and a guy who’ll call occasionally to say “Hey, maybe you should build a Laundry,” or some such advice. 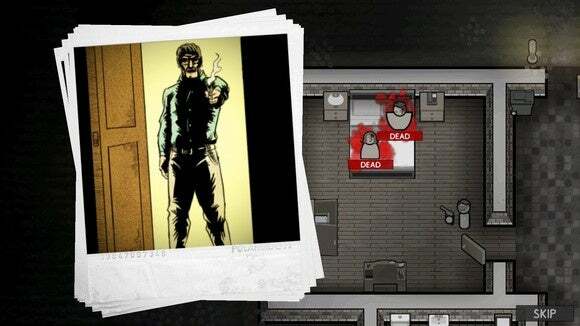 Chapter One loads up automatically when you initially launch Prison Architect, and it will take you through the basics (and beyond) before you brave Sandbox mode. I actually think it works pretty well, giving some sort of framework for players to work through before they’re turned loose. The story takes cues from Hollywood, featuring lurid crimes of passion and mafia dons and riots and stabbings in the shower and the crazy tough-on-crime mayor who maybe doesn’t have the purest of intentions. It’s a bit predictable (read: overwrought) but it’s entertaining enough to keep you going until you feel comfortable with all Prison Architect’s systems. And to be honest, it’s more than I expected from Prison Architect. The team’s been pretty clear they’re trying to stay somewhat apolitical with the game, but much of what I saw in the campaign comes down pretty heavily on the “We need prison reform” side of the argument. State-sponsored corruption, profiteering, dehumanization of prisoners—there are some surprisingly heavy topics dealt with here, albeit in cartoon form. Which is not to say that Prison Architect’s only merit lies in the in-your-face moralizing of the campaign. Far from it. 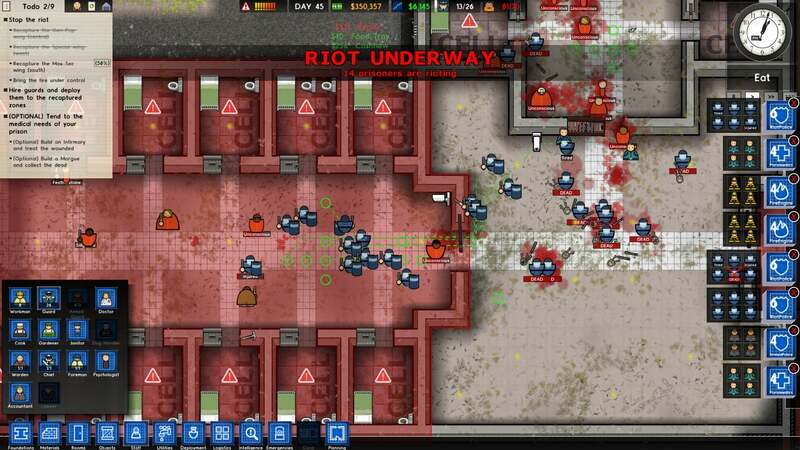 There’s been some hand-wringing around Prison Architect, similar to Battlefield Hardline—talk that it trivializes prisons by reducing the system to a game, et cetera. On the contrary, I think Prison Architect does a pretty good job exploiting what games do best: teaching through doing. Put aside the campaign, and Sandbox mode still provides a fascinating look into a life totally alien to many people. Prison Architect demonstrates how and why our prison system fails inmates, and it does so by reducing everything to a single number: Money. Prison bankrupt? Bring in new prisoners. Can’t house them properly? Stick them in a holding cell. Collect money from the state for their existence. Bring in more prisoners. Do the same. Force your prisoners to work. Sell their work and turn it into profit. Scale back on optional programs—drug treatment plans, substance counseling, entertainment options. We’re all principled until those principles are tested, and in Prison Architect they’re tested all-too-often. It’s easy to, in the process of playing and optimizing your prison, suddenly realize you’ve abandoned your core values. And sure, it’s couched in adorable sprites and Sims-esque building tools, but the reality of the American penal system isn’t far off. Prison Architect is valuable (especially in Sandbox mode) because it says a lot about modern prison systems without long speeches, without awkward moralizing. Instead, it forces you to make tough calls and learn from them. The question is whether you’ll apply what you learn. My main complaint about Prison Architect is that there’s more breadth here than depth. For instance, if your prisoners are bored you don’t have many options with which to entertain them: TV, radio, pool table, books, weights. And while my extremely-limited knowledge of prison life says “Yeah, that sounds about right,” the resulting game sometimes feels like it railroads you into a single solution for each problem. Your first prison’s fun to lay out and construct. Your second prison slightly less so. Your third prison rote. And so on. The game’s also obtuse about the systems behind its systems. How many benches do I need in my canteen to feed twenty prisoners? How much will this TV improve my prison’s Entertainment score if I stick it in a common room versus in a prisoner’s cell? Does putting fancy tiles down in the laundry do anything to improve my prison, or is it a purely aesthetic change? While some amount of experimentation is always welcome in a builder game—that’s basically what these games are about—the lack of information in Prison Architect can be a bit frustrating. If you’re looking to optimize your prison construction, this is still very much a “Look at a Wiki” sort of game. Prison Architect‘s also added an entirely new game-type to round out its Official Launch Content, called “Escape Mode.” It’s the flipside of the equation: You’re Shawshank Redemption’s Andy Dufresne, Frank Morris of Escape from Alcatraz, Steve McQueen in The Great Escape. You’ve been thrown into jail and have to escape by any means necessary. I’ve heard Escape Mode compared to Hotline Miami a few times now, but I think that’s a bit generous. The controls are nowhere near as tight, the combat not snappy enough, for this to be Hotline Miami but in jail. But it’s sort of similar, in that it’s top-down with a heavy focus on melee combat, and you’ll most likely kill one or two (or more) guards before escaping. The safest way to escape is to build your strength over time. Getting in fights, destroying prison property, and the like will earn you “Rep Points,” which you spend to upgrade your character and recruit other prisoners. Create a whole gang, upgrade all of them, and you’re ready to take on the guards head-on. There are quieter ways, though. You don’t need to break into the armory. 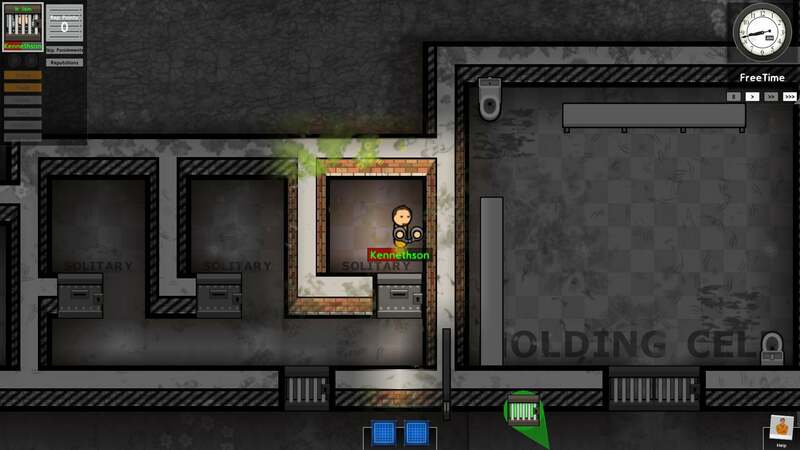 You can sneak out, or dig a tunnel, or pretty much anything your prisoners typically do when you’re in Sandbox mode. Any prison uploaded to Steam Workshop is eligible for Escape Mode, so there’s basically a limitless number of random seeds for you to try and escape from. It’s an interesting addition—a good change of pace when you’re tired of building—and I’m curious to see how people enjoy it. Though I do think the controls need to be tightened up. Also, I wish there were more of a focus on rewarding the player for behaving—following the prison’s schedule, obeying guards, sleeping through the night. At the moment, there’s no incentive for good behavior because you only earn rep points for being a jerk. Quite the opposite, in fact. 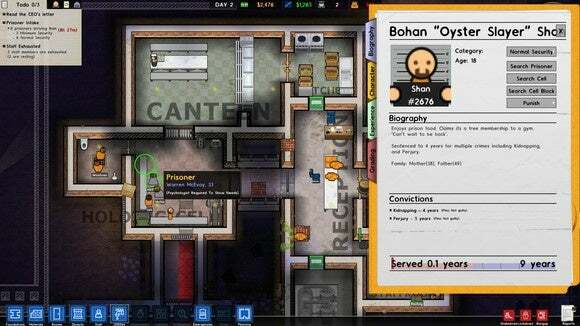 Prison Architect is a mostly-honest and unflinching look at our modern society and its approach towards prisoner rehabilitation...or lack thereof. It’s a fascinating game, in no small part because it so expertly casts a real-world debate in video game terms and in doing so forces players to examine their own beliefs. And it’s a hell of a lot of fun, besides. 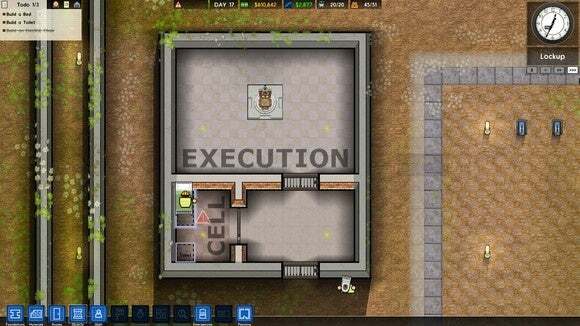 Prison Architect's genius is in translating a real-world debate into video game terms, forcing players to make tough choices with no good solutions.